Councellor Gabriel Angeli bani Shaea bani Ordo Hermetica, Scrollwarden, Guardian of the Codex, Seeker of the Lost, Coville's Bane, Adept of the Crescent Moon. Gabriel is an expert on ancient lore and languages, specializing in the Near and Middle East. She is teaching two courses at UT Arlington this spring, a class on Aramaic for a more general audience and a graduate seminar in Linguistics on using poetic meter to extract phonology from ancient texts. She has an office on campus in the basement of the Department of Languages and keeps regular office hours in addition to class times. She is currently serving on the Chantry Council along with Jeremy and Gwion. Members of House Shaea are known among the Hermetics as 'crazy cat ladies' regardless of actual gender and she is not one to pointlessly buck traidition. Dinah and Pounce are her feline overlords. 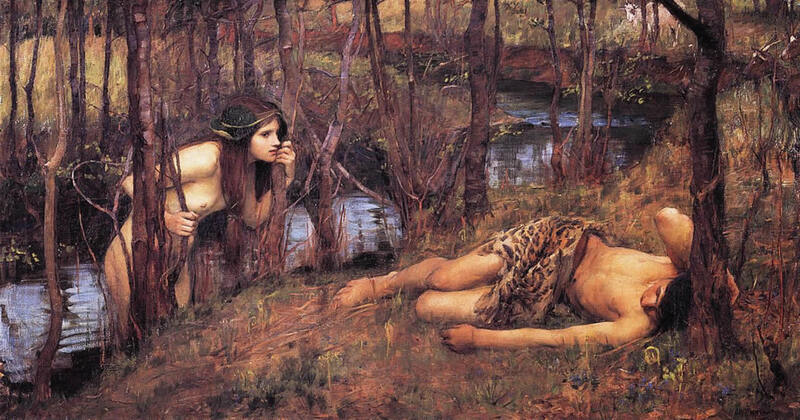 The sketch above by Waterhouse was for a painting known alternately as Naiad or Hylas And The Nymphs which you can see by clicking the link below. Gabriel is blond and blue-eyed, but the proportions are just about right. Private Lessons in any of the many languages known by her. Creative, Academic & Technical Writing. Teaching those spheres she has. Born in London, 25th of March, 1976. PhD in Linguistic Archeology from Oxford University, UK. Doctoral dissertation title: Linguistic cross-contamination as a means of tracing Indo-European Migrations. Former Associate Professor in Linguistics at Tulane. Has recently been traveling in the near and middle east. Guest lecturer in Ancient Languages at UT Arlington. Will be accepting a tenure-track position at the Graduate Insitute of Applied Linguistics at Dallas Baptist University in the fall. Wait, I'm not a mage! Initiated into House Shaea of the Order of Hermes 1997. Her mentor & sponsor was subjected to Gigul as a Nephandus. 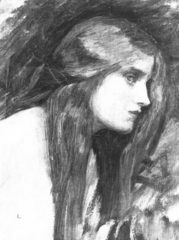 Gabriel herself was involved in his discovery and apprehension in New Orleans. She holds a grudging respect among members of her tradition, despite being critical of their inaction and resistance to internal policing. Her position within the Order is as an archivist, an expert at finding facts buried within thousands of years of writing. These represent the ‘+notes’ information set on her character, repeated here for ease of reference and reading. For protection, Gabriel carries a shot-pistol. This is the result of an application of the Semi-Auto-CAD/CAM rote to combine attributes of a .410 light shotgun and a .38 police special revolver. The result is only slightly bulkier than the original, is mostly useless past 25 meters, and very damaging close up. She's almost never without a 4-inch folding knife, but this is a tool first, weapon second. Gabriel is part owner of Out Of Order, a large home she shares with with Lotus and their Feline Overlords Dinah and Pounce. To summarize the Thelemic magical system is impossible. The apostate Crowley managed very well, but the resulting statement is so riddled with traps and magical jargon as to be worse than useless to anyone who has not worked to understand the intricacies (and intentionally so.) “Do what thou wilt shall be the whole of the Law. Love is the law, love under the will.” Unfortunately none of those words are used in their conventional sense. Do what you as a whole and inherently divine being would want to happen. Be the change you would see in the world. This view is heavily influenced by Gnostic philosophy, where the world of Consensus Reality is a crime against God to hide the true world and our true selves from us. In the end, there is no us, no you, no me, no spoon, only will. Ceremonial Magic provides a praxis, rather than a paradigm, involving symbols, names, numbers and aspects of performance art. Names and incantations are written on skin, paper or in the air, circles are drawn defining the ritual space, often while chanting some formula. The ritual items are prepared and placed within that space now or in advance. Powers are invoked and the will is focussed upon the desired result and the spell thus constructed is released. This can take hours or seconds, but the process remains essentially the same regardless. Paper itself is a metaphor for space, especially one with drawings or names upon it. Spoken words are ephemeral, gone and lost to silence. Upon an amulet is set a fulgurite, a stone born of a lightning strike. On the reverse is the Seal of Solomon which binds nature to a magi's will. A cup, representing the Cosmic Womb and anointed with blood, the essence of life itself. The names of people, scribed or intoned, represent their souls, and their minds are the ripples on the surface. A knife, the tool mankind has used to change the world since time beyond memory. Again, the amulet has ties to the spark of creation, light and flame fused as one. The swirls and flow of smoke reveal spirits and the unseen world in which they travel. Numbers count the heartbeats, the seconds, the hours, describe the cycles of heaven that are the essence of time. *Foci are not needed for Correspondence, Prime and Forces effects. Your Mentor is engaged in acts that could cause a tremendous uproar. She could be wantonly ignoring Protocols, causing havoc with vulgar magic and Paradox, dealing with Nephandi or torturing captured Technomancers. Plenty of folks are after your Mentor's hide, and your skin may be tarred with the same brush. — The Book Of Shadows, p.43 NOTE: this flaw has been resolved, but is a part of Gabriel's background. I was requested to supply lyrics, and so here they are. If you want to hear the song, let me know and I'll get you a copy. It is most lovely. And the night flows away. Half a mile over Dresden. Through broken bits of china. I keep on trying to find this. The song is, as you might guess, about Dresden, the German city destroyed by allied incendiary bombs during World War II in retaliation for the bombing of London. This song choses an odd protagonist, being from the point of view of one of the bombs. For such an object, the flowering into bright flame, the destruction and explosion must be the ultimate experience, the true expression of its nature into the world. The bomb is consequently very very happy.